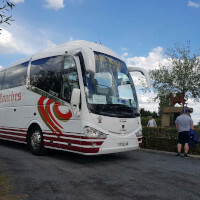 Here at Pats Coaches we know that arranging the travel needs of many can be a hard task and stressful to say the least, be it travelling within the United Kingdom or going over to the continent, this is why at Pat's Coaches we are flexible to help ensure your trip will run smoothly. So even If you want to book a coach for a city tour or a sightseeing venture, Pats Coaches is the right choice for you. With over 40 years of experience in the transport industry and being one of North Wales most trusted operators, providing excellent levels of service, Pats coaches have the resources and capabilities to cater for all your Holiday needs. Here at Pats Coaches we will also assist in the planning of your trip. Our experienced team has an in-depth knowledge of a range of cities, towns and countryside as well as experience in dealing with local attractions and places of interest. To discuss your holiday requirements further, and to ensure we are able to meet all your requirments do not hesitate to contact us, we will be happy to assist in designing a trip that caters for all your requirements. To contact us either use the Online Form or call us to speak directly to our team who will be happy to help.